Although Mary Street Bakery hasn’t been around for as long as some of Mount Lawley’s breakfast spots, it has pretty much become a Beaufort Street landmark in the foodie stakes. Bakery and coffee hub by day and an international charged menu by night, Mary Street is a bit of a one stop for your loaf of bread, a strong coffee and a salted caramel donut (of course)! This certainly wasn’t my first visit, and it definitely isn’t my last. There are still so many items on the menu I just NEED to try! My friend L and I visited MS on a chilly but sunshine fuelled Saturday morning. With plans to spend the rest of the morning shopping for vintage bargains we knew we needed food energy, and L was craving eggs and soldiers. 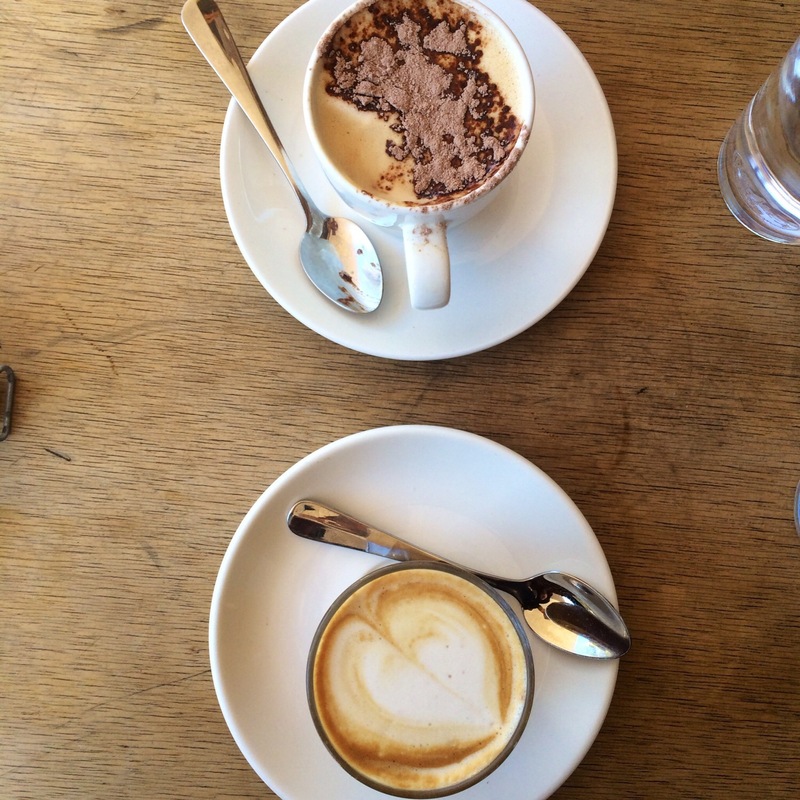 My first piece of advice when visiting the super cute cafe… Get there early! We arrived around 9.30AM and had our choice of tables (we decided on a street seat) but come 10AM there were at least nine groups of people waiting for a spot to sit. And no one likes watching other patron’s eat when they can’t! We were seated by a friendly blonde waitress, who immediately asked us if we wanted a coffee whilst we looked at the menu. I love it when this question is asked straight up, because of course we wanted a coffee! 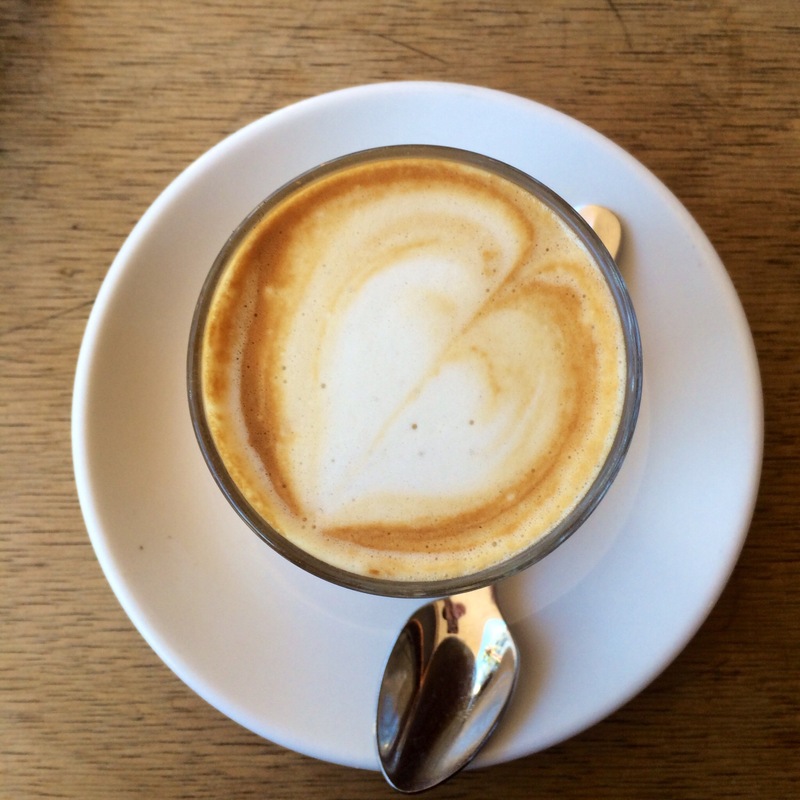 No one really needs time to pick a drink, so waiters and waitresses take note – ask about ordering coffee immediately! The menu is creative with so many weird and wonderful dishes to choose from including the Coconut Rice with Mango and Pork Belly (for breakfast!) 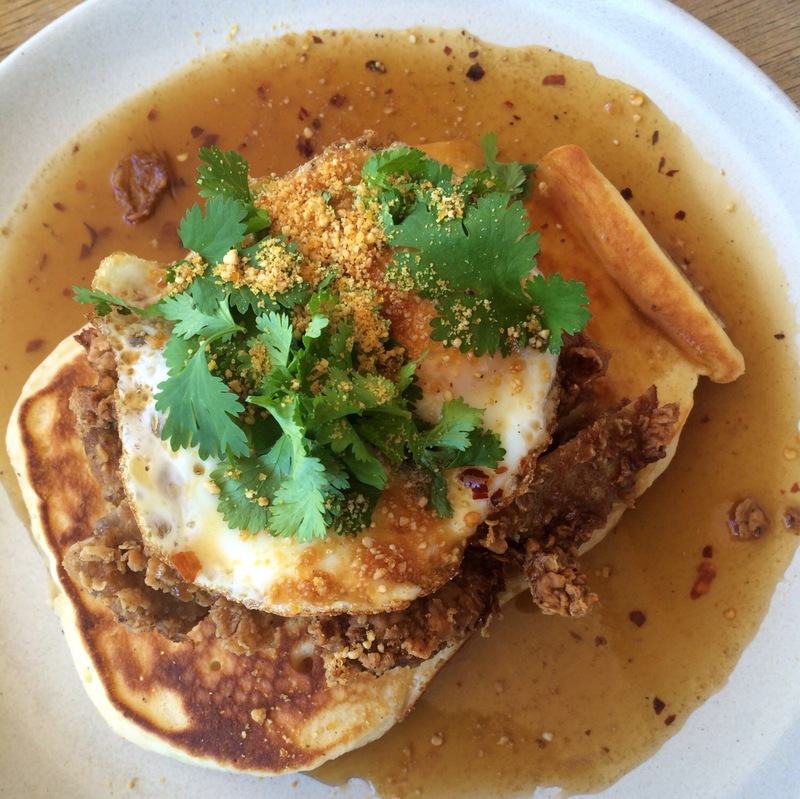 but I had my heart set on the Fried Chicken Pancakes whilst L couldn’t pass up Boiled Eggs and Soldiers. Secret is out – I’ve never tried savoury chicken with sweet pancakes and maple before, so I wasn’t quite sure what to expect ordering something I’d never usually order. But thinking back to the same dish from a previous edition of Brunch Club, when I saw the dish on the menu I couldn’t say no. When the dish arrived it was a beautiful, glutenous mountain of thick, fluffy pancakes, crisp chicken and a perfectly fried egg smothered in glistening maple syrup. Bizarre but beautiful, the dish looked too wonderful to eat! I’ll admit I hesitated with my first bite, unsure how the obscure flavours would sit well together, but now I totally get why the combination is so popular! The pancakes were delightful, airy and light with no sponginess. Thick enough to encase the crisp, salty chicken it really was a burst of flavours when eaten together. The egg was the perfect edition to the dish, oozing goo all over the chicken. Perfectly cooked and that little bit crispy I was so impressed. I never order (semi) sweet breakfast dishes, but this was the perfect balance of sweet and savoury! L’s breakfast was cute as a button. 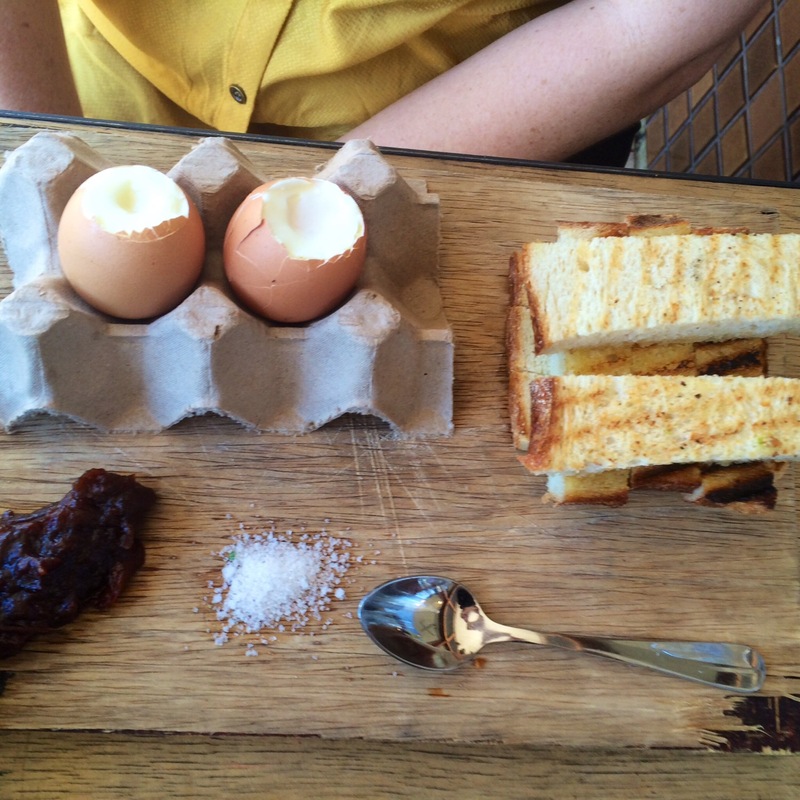 Eggs and soldiers is such a throwback to childhood, and it was so sweet to see her dipping her toast in the eggs. She opted for a side of mushrooms to bulk up her brekky, and they smelt and looked amazing! The eggs and soldiers were also served with a tomato relish, adding a more adult touch to dish. If you want a little flashback to being a kid, this is the dish for you! Now to the coffee. Although the brew was strong and smooth, both coffees we ordered were luke warm and we pretty much agreed they came to us at a scull-able temperature! Might just be me, but I love my coffee hot so I have time to chat and drink simultaneously without it going cold. Next time I visit I’ll be asking for it “extra hot” just to make sure it’s a better temp for this coffee nut. But besides the temperature it was a lovely Soy Long Mac, so I did order a second! I was so full post breakfast that I couldn’t fit a sweet treat in, but if you are feeling naughty I highly recommend the Salted Caramel Donut. Oozy and gooey, it’s a very cheeky treat, but so worth the extra half hour on the treadmill. If I lived in Mount Lawley I’d probably visit weekly… So lucky I don’t or my jeans totally wouldn’t fit! What is the best thing you ate this week? Nothing so adventurous for me this week but my own curry,,,,which, dare I say, was yummy. I love the fried chicken dish at Mary St Bakery! If you’re feeling like something lighter, I had the salmon breakfast and it was to die for!